There’s a saying in the mountains of North Carolina. If you don’t like the weather here, wait 15 minutes; it will change. We do have four distinct seasons, and sometimes two in the same month. This February lives up to that reputation. A week ago, there was several inches of snow on the ground. Today, motorcycles and bicycles were everywhere. The sky was blue. Children and dogs roamed the trails and water flowed. The temperature was in the mid 60s. We hiked the trails near Craven Gap along the Blue Ridge Parkway. This trail has the notoriety of having been trekked by the President and the First Lady on one of their recent trips to Asheville. Who is Bele Chere and how did she get her own festival? Belle Cher is some chick on Facebook, but Bele Chere is an annual event in Asheville, North Carolina. It is always held during the last weekend of July. According to the organizers, Bele Chere means “Beautiful Living” in an ancient Scottish dialect. I’m not ancient Scottish, so I’ll take their word for it. It’s a fitting name, however, as the event meanders through the blocked off streets of beautiful downtown Asheville. Free live music is a staple at Bele Chere. Multiple stages are setup at different points throughout the festival map. Genres of virtually every type can be heard at the 3 day event. The wide array of talent, offers something for everyone. As one attendee said, If you don’t find fun and music you like at Bele Chere, then you don’t like fun and music. 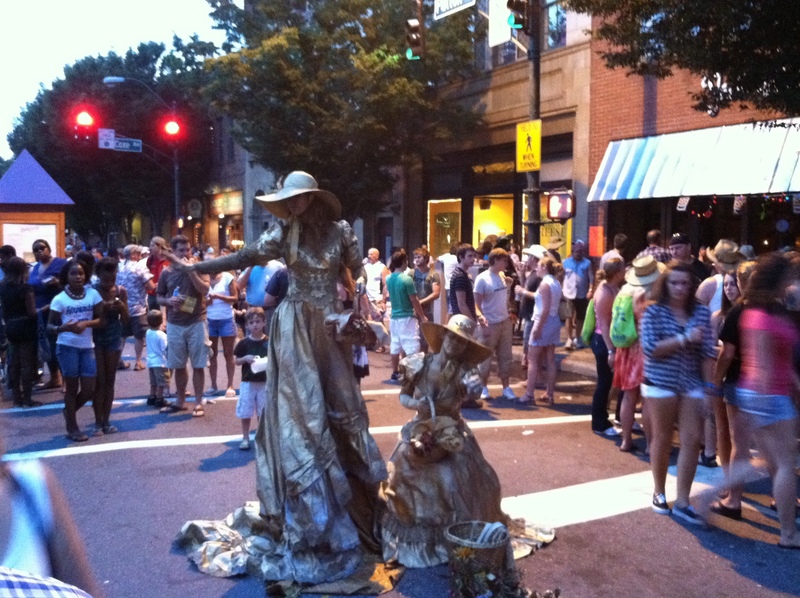 Asheville is known for it’s diversity, and people watching is part of the fun. A few dress in costumes and there is never a shortage of eclectic attire. 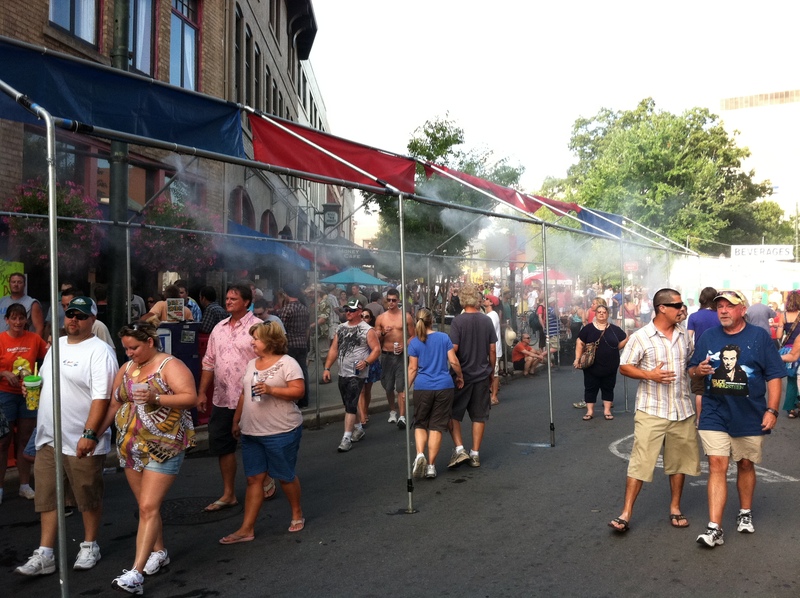 Bele Chere has sort of a Mardi Gras air about it, but with a western North Carolina flair. Local Street musicians and performance artists display their talent as an integral part of downtown culture. You are asked not to bring any pets to the festival. This sounds like a real drag as a dog lover, but after watching the City of Asheville’s video explanation, I fully support the position. The Ultimate Air Dogs attraction continues to bring enjoyment to the event, however. A few pictures and a short write up can’t possibly describe such a wonderful event. The sounds, motion and mood is unique to Asheville. In short, if you have a festive spirit and don’t mind a good crowd, then the Bele Chere Festival should be your destination next July. Click here to see a quick slideshow. I have lived in Hendersonville, NC all my life. Meeting people that have relocated here from all over the world has taught me that Hendersonville, North Carolina is the best place to live! Many professionals who have lived abroad have told me that Hendersonville, by far, has been the place they love the most. Charleston is only 3.5 hours away if you want to satisfy your need for sand and surf. Boone, North Carolina is only 2 hours away for a great mountain ski getaway. The Biltmore House with it’s grand architecture, expansive lawns and lovely flower gardens draws hundreds of thousands of visitors annually. 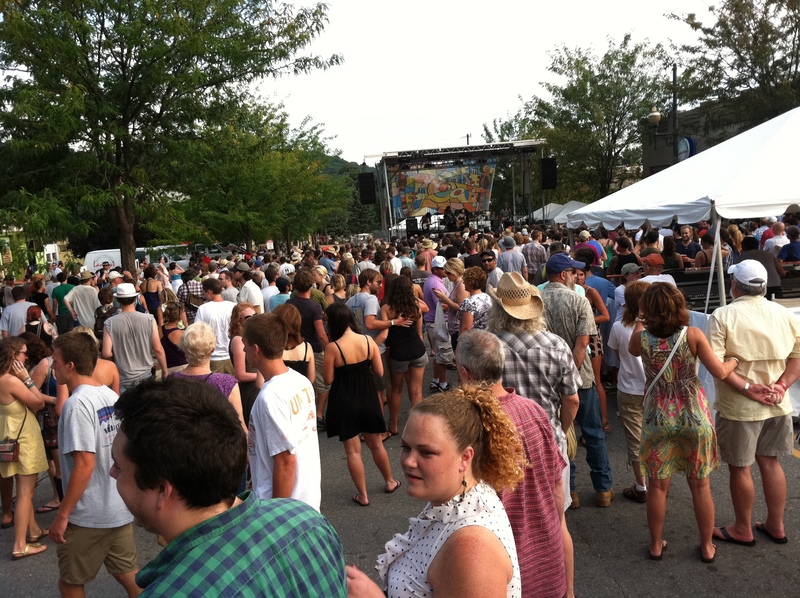 Asheville has been voted Beer City USA 3 years in a row due to it’s active craft brew culture. There are about a dozen breweries to choose from within a 30-45 minute drive. Tours are available at most of them and the atmosphere is casual. Hendersonville is proud to have it’s own Southern Appalachian Brewery which opened recently. All of these surrounding areas are wonderful places to visit, but living in Hendersonville, is “Better every day in every way!” Many enjoy evening strolls down Main Street, meeting up with friends. There is fine, yet casual dining, art galleries and now the Flat Rock Playhouse has opened a venue right on Main Street. We have a strong Chamber of Commerce sponsoring many annual events such as The NC Apple Festival, Garden Jubilee and Music on Main Street, just to name a few. If you are an avid golfer, I don’t have to tell you that we have some excellent golf courses. We boast the private award winning Tom Fazio course at Champion Hills, Hendersonville Country Club, and the Joe Lee designed course at Kenmure in Flat Rock. Public golf courses include Cummings Cove, Etowah Valley, Highland Lake, and Crooked Creek. Many more great courses are withing an hour drive. If you can visualize yourself loving this area as much as I do, give me a call. I’d love to find your dream home here in the mountains.